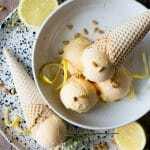 This lemon ice cream is made with the famous Italian liqueur Limoncello. It's smooth, creamy, packs a boozy punch and better yet it's so simple and easy to make. Add the cream, milk and lemon peel to a sauce pan and bring to a boil. Meanwhile whisk the egg yolks and sugar together in a bowl until light and fluffy. Top Tip: When the milk and cream comes to a boil turn off the heat to avoid it overflowing and set it aside for 1 minute before continuing with the next step. Remove the lemon zest from the milk and discard. Very slow, gradually add the hot milk mixture to the beaten eggs and sugar whilst constantly whisking. Continue until the mixture is completely incorporated. Add the mixture back to the saucepan and heat on a low heat whilst stirring with a wooden spoon. It'll take about 10 minutes for the mixture to thicken enough to coat the back of the wooden spoon. Once thickened, remove from the heat for 10 minutes then add the Limoncello and stir. Set aside to cool for around 20-30 minutes before using the ice cream machine. Bring the freezer bowl out of the freezer and place into the machine, add the paddle and the top then turn it on. The machine MUST be on and turning before adding the ice cream mixture. Pour the mixture into the machine and leave it to churn for 25-30 minutes. You’ll have very soft ice cream at this point (still great to eat straight away if you can’t resist). Spoon the mixture into a freezer proof container and freeze for a few hours or overnight to stiffen. Make sure the ice cream mixture is as cool as possible before pouring into the machine. Make sure the machine is on and the freezer bowl or paddle is turning before pouring the mixture into the bowl. If the mixture is poured in before it will freeze solid and possibly break the machine. Only bring the freezer bowl out of the freezer when you are ready to churn the ice cream. The longer it is out of the freezer the longer it will take to churn the ice cream. When the milk and cream comes to a boil turn off the heat to avoid it overflowing and set it aside for 1 minute before continuing with the next step. On the final step when heating the eggs, milk and cream together make sure it is on a very low heat and you constantly stir with a wooden spoon to stop the bottom burning and the eggs scrambling. Don't be tempted to heat it quickly or you'll be left with lumps.